Documentary filmmaker Greg Barker takes a simple premise and, through nothing more than some solid editing and a clear-eyed focus, creates an insightful and surprisingly moving snapshot of one of the most tumultuous events in recent political history. To be more accurate, Barker documents the calm before the storm, taking a fly-on-the-wall approach to President Barack Obama and his staff as they live out their last year in the White House. 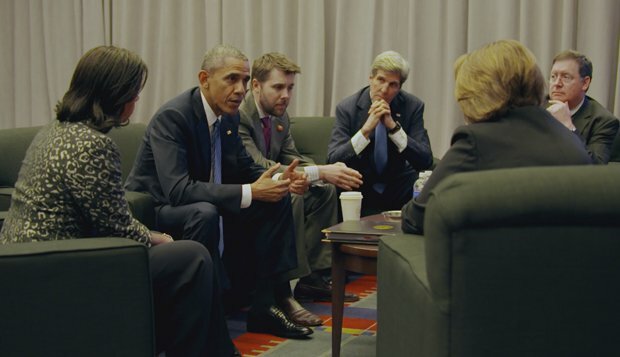 Barker and cinematographers Martina Radwan and Erich Roland are given virtually unrestricted access to the team – although not to Obama himself, who appears only briefly – as they attempt to bring eight years of hard work to a neat close before the final whistle. Focusing particularly on the foreign policy team, including Secretary of State John Kerry and Ambassador to the United Nations Samantha Power (who, remarkably, balances her demanding job with parenting young children), the film records their attempts to bolster diplomatic relations and strengthen ties in all corners of the world. Editors Joshua Altman and Langdon Page have done a terrific job pulling together hours of footage into a coherent, chronological narrative which captures the sheer breadth of the international issues at play, and celebrates individual achievement. It's a fascinating look at global politics in action; the pace is relentless, the mood is buoyant and the ambitions know no bounds. It's all shot through, of course, with the horror of hindsight. Throughout the majority of the film, staffers believe that Hillary Clinton will follow Obama into the Oval Office and pick up where they left off. Reactions when Donald Trump secures the presidency range from disbelief to raw, open grief – all valid responses, given how far the pendulum has swung since Trump took office. In that respect, The Final Year holds a deep resonance as, perhaps, an elegant eulogy for the democratic process. Limited release from Fri 19 Jan. Documentary about Barack Obama’s final year in office, focusing on the team (and the foreign policy team in particular) rather than Obama himself; a fascinating and surprisingly moving look at global politics in action, shot through with the horror of hindsight as it becomes ever more clear that Trump will succeed.